Your lawn is the window of your house’s soul, as they say. Meaning, people judge your home from the way your lawn and landscaping looks. For this reason, you probably like to take care of your lawn. That can get expensive though, especially when you have to do it year after year. While a pristine lawn might cost a pretty penny, there are actually some ways you can cut costs while taking care of your landscaping. Here are just a few of those tricks that will make you and your wallet happy for years to come. Most lawns need about one inch of water every week to remain healthy. This includes precipitation. However, a single large tree can soak up of water every year, so your lawn might need more than that if you have a lot of trees. You also might have to adjust the water levels if you are having a particularly dry summer. It’s best to water your lawn in the early morning, between 5 am and 10 am. This allows the water to soak into your grass, plants, and roots to give them all the moisture they need throughout the day. Watering during the heat of the afternoon just leaks to evaporation. Watering at night can lead to insufficient moisture the next day. Instead of using a bagger on your lawn mower to pick up the grass clippings as you ride along, get a mower that turns your clippings into mulch. Mulching lawnmowers take the grass and chop is up into tiny pieces, creating a fine green mulch that gets spread over the lawn as you go. The mulch typically vanishes down into the gress within a day, so it doesn’t make your yard a mess. These mulch-like grass clippings are a free source os slow-release fertilizer. It can actually cut your fertilizer costs by up to 30%. A lot of people carry the misconception that if you cut your grass really short, you won’t have to cut it at often because it will take a while for it to grow back, which will save you money. While that is technically true, it isn’t good for your lawn or your wallet. If you cut your grass short, it dries out down near the ground. Taller grass needs less water, less fertilizer, and less mowing. You should never cut your grass shorter than about two or three inches. It allows the plants to shade their own roots and soil, helpful restore moisture and reducing the need for watering. If you’re thinking about planting flowers around the yard to add some pretty touches to your landscaping, then you should definitely consider planting perennials instead of annuals. Perennials grow back every single year. This means you don’t have to go out and buy new plants every year. These plants will require care, but most outdoor plants do. You really just have to make sure they are getting enough water and sunlight, and trim off the dead flowers when they wilt off. A little bit of time can save you a lot of money. You want your yard to look nice, and that’s easy to understand. 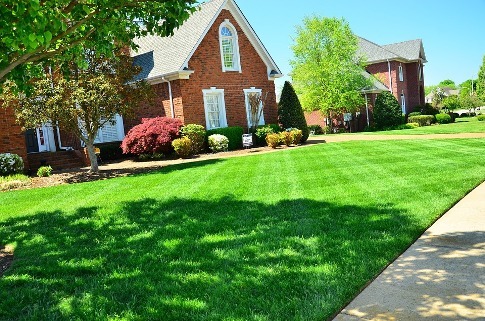 Try some of these tips this year to make your lawn look great without having to dish out a ton of dough.